WhatsApp is working on a new feature that will make it much easier for the users to control if they want to be added to a group. The feature is more like an invitation control mechanism that will let users decide who can add them to a WhatsApp group. The feature is currently under closed beta testing phase on iPhone, as part of the Test Flight program, and will soon be expanded to more users with the next beta update for WhatsApp on iPhone. The WhatsApp group invitation feature is limited to the app’s iPhone version as of now and was spotted by WABetaInfo. The feature will soon hit the app’s Android version as well. However, the group invitation control functionality is currently in an inactive state because it is reportedly still under the early stages of development. As for the feature itself, it will be located in the “Privacy” section, which can be accessed by following this path on WhatsApp’s iPhone client: Settings > Account > Privacy > Groups. The Groups option allows users to choose between three variables and will come into play when a WhatsApp group admin wants to add them to a group. The first option –“Everyone” – will let anyone add the user to a group, without the need for an invite. The second option – “My Contacts” – will only allow an admin, who is in the users’ contact list, to add the user to his/ her group. Others will have to send the user an invitation, which the user can then choose to accept or decline. 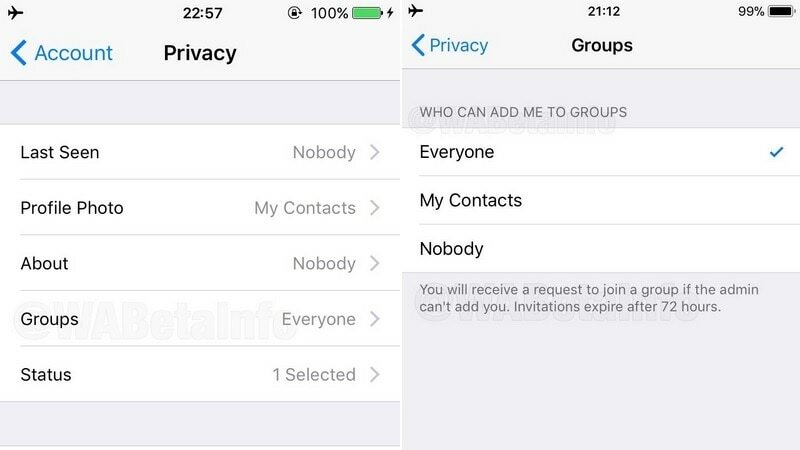 Lastly, the “Nobody” option will block everyone from adding users to a WhatsApp group. Enabling this option means all admins have to send a group invitation in order to add users to a WhatsApp group. However, the users will have to take action regarding a group invite within 72 hours of receiving before it expires. Once the invite expires, the users can only join a group when the admin sends them another invitation. However, the users will be able to join a WhatsApp group via a group link invite irrespective of their group invitation settings. Additionally, the redesigned Settings menu on WhatsApp for Android is now widely available to all users running version 2.19.47 of the beta app. The aforementioned build also brings translated subtitles for the options in different languages.